In the summer of 1905 the 2 masted schooner E.M. Sawyer was on her way to Rockland harbor; when after drifting for 18 hours in the fog she ran aground at Lobster Cove, Monhegan. The 94 foot, 131 ton schooner was built in Jonesport, ME in 1869 and used Machais as its homeport. The captain of the vessel did not hear the fog horn on Manana, his first warning of approaching land was the sound of the surf against the island. He did not have time to change course before the ship was driven onto the rocks. The Sawyer was a total loss. 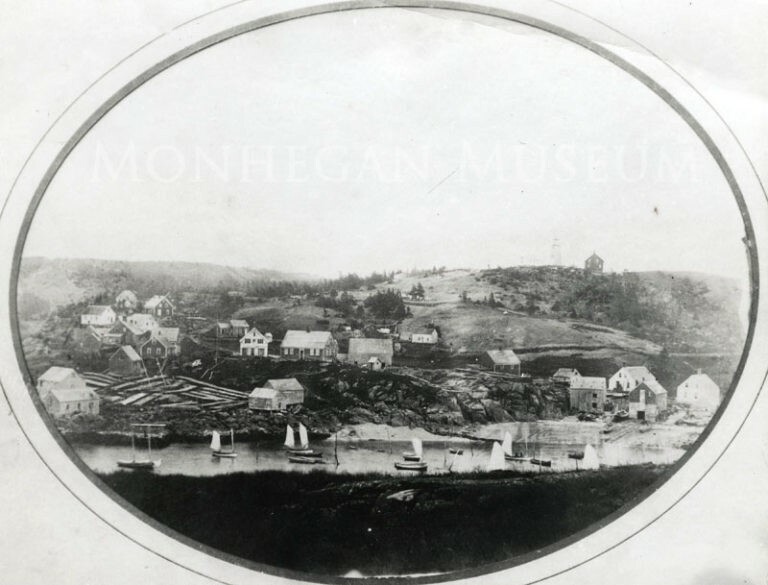 Her masts, anchors, chains and iron were sold at auction; and the timbers were salvaged by the people of Monhegan. The E.M. Sawyer is one of many vessels that have wrecked at Lobster Cove; the remains of the wreck of the D.T. Sheridan which wrecked in 1948 can still be seen there today. Thank you for supporting the Monhegan Museum with your purchase of this archival photographic print. This image is printed with an Epson Stylus Photo R2880 with Ultrachrome K3 archival inks on Moab Entrada 100% cotton rag paper.